The digital generation may be unfamiliar with the experience of leaping around their bedrooms to favourite tunes, only for their exuberance to result in the needle skipping a groove or two. While it’s unlikely to cause any damage to either the vinyl or the stylus, it has a way of disrupting the flow and making you feel like a bit of a buffoon. There’s Kent four-piece Salvation Jayne’s EP suggests, it contains rock nuggets potent enough to inspire bedroom moshing, although it’s not being released on vinyl. After a brief introductory segment, the EP gets going properly with ‘Burn it Down’ which we covered when it first aired back in April. And it’s a cracking tune, chunky blues-based guitars chopping against a sinewy lead line and strolling bass. It also meets the ‘monster chorus’ requirement for a strong rock tune. 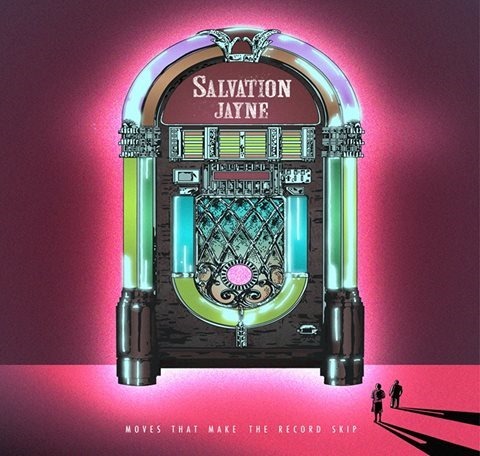 And yes, tunes matter: on Moves That Make the Record Skip, Salvation Jayne offer tunes, with strong vocal melodies shaping the songs. If ‘The Jailer’ contains all of the elements of infinite 80s rock bands and reminds me of many, many pub gigs I caught at the tail end of the 80s and into the early 90s in my home town (for all I know, there are still the same sort of bands cranking out the same stuff in the same venues now: Lincoln never was the most progressive of places), it’s well-executed and has the guts in the delivery to make it work. There’s also some nice slidey guitar action that brings a dirty country / blues vibe. ‘Thrillride’ starts with a low-slung bass and sassy, semi-menacing vocal from Chess Smith before she gives it some throat and everything kicks in. EP closer ‘Whorehouse Down on the SE’ makes for a strong finish: it’s a percussion-driven hefty rock workout which has all the makings of an anthemic crowd-pleaser live. It mines a proper old-school rock seam, and calls to mind The Pretty Reckless at their best, with Smith giving it the raw, rough ‘n’ tough treatment.